Borussia Dortmund are top but what can Tottenham expect from them at Wembley? It is a long time since Wiz Khalifa was relevant but the black and yellow of Borussia Dortmund definitely is again. When the single that shares its name with the German team’s colours was released, the best part of a decade ago, they went on to win the Bundesliga. Now they are back on top again, the schwarz und gelb coming to Wembley to take on Spurs as one of the most exciting teams in Europe. They possess the capacity to do serious damage in the Champions League as well as capturing the title. Sportsmail has taken a look at Dortmund and what to expect from them ahead of their clash with Tottenham. Where Jurgen Klopp’s football at Dortmund was called ‘heavy metal’, Lucien Favre has been credited with turning his team into creators of ‘modern jazz’ in the German press. That means there is plenty of room for individual expression, but it has to take place within a well-defined structure, making sure those talents work well together. Dortmund like to play out of the back and if they break that initial press, they can be incredibly dangerous — especially if they are afforded the opportunity to move up the field quickly. They are experts of one-touch passing moves that beffudle the opposition. Jadon Sancho is, unsurprisingly, particularly effective in those moments. Counter-pressing them is a risk, although it is Tottenham’s preferred method of engagement. They have deep central midfielders who are comfortable on the ball and battle well in Thomas Delaney and Axel Witsel. They are slightly less effective when asked to dominate the ball and try to patiently work their way through the lines. Dortmund also use their full-backs high up the pitch. A slight positive to their injury crisis is that Achraf Hakimi, on loan from Real Madrid, is likely to play in his preferred berth on the right of defence. He has created six chances from that position this season in the Champions League, which is impressive, especially when he has often had to fill in on the left. Delaney insisted they would not change their style to match Spurs when speaking at Wembley on Tuesday: ‘It’s not much different from normal. Of course, we have lots of respect for Spurs. We know their strengths but I couldn’t say which tactics they’ll use. 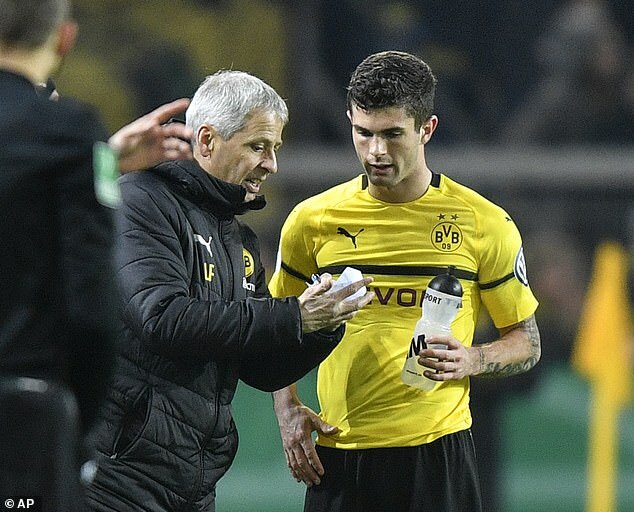 A big positive for Dortmund is that they are likely to have Favre on the touchline on Wednesday night after his temporary enforced absence due to illness. Favre may go under the radar in England but he has been making waves in Europe for quite a while. At both Hertha Berlin and Borussia Monchengladbach, he took teams with mid-table budgets to high finishes in the Bundesliga. When he moved to Nice in 2016 to replace Claude Puel, he took them to a best in decades third-place finish. ‘We tried to get Favre before but failed every time,’ chief executive Hans-Christian Watzke admitted at his unveiling in the summer. It has been worth the long wait. While the job is not done at Dortmund, he is the first manager since Klopp to have them involved in a realistic push for the title. Favre is well liked both among fans and the media in Germany, and should be in situ at Signal Iduna Park for the long-term. 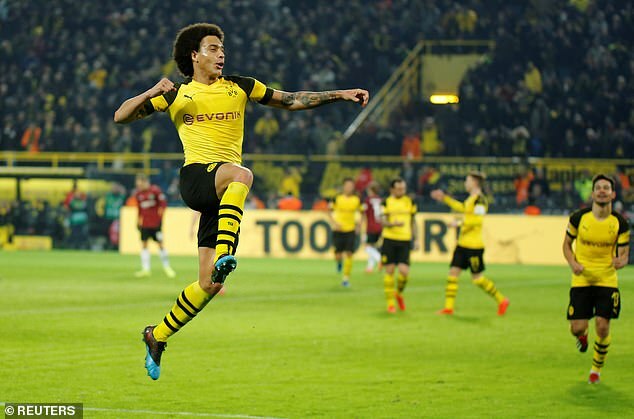 While Sancho’s breakthrough has made headlines on these shores, Witsel’s arrival in the summer is arguably as important to their title push. He had dropped out of the glare by moving to China and managed to earn around £20m in the space of 18 months. But Dortmund and Bayern Munich both went in for him this summer, with Dortmund winning out. His national team manager Roberto Martinez said: ‘The best transfer in the world this season is Axel Witsel to ​Borussia Dortmund. He is the best investment in European football. The 30-year-old is the player who makes Dortmund tick. He has a pass completion rate of 96 per cent in the Champions League, better than anyone else. It seems as though he is finally hitting the heights that were expected of him when he first emerged on the scene. Pushing a team like Dortmund to the title would be a crowning achievement in his career. A quirk of Dortmund’s season has been the manner in which Christian Pulisic has dropped out of the side. 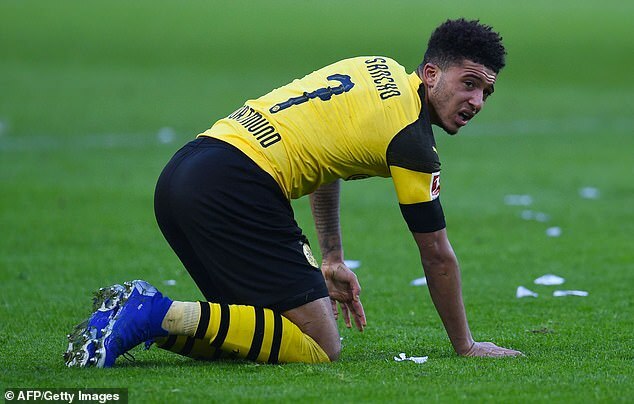 Admittedly, Sancho is undroppable on the basis of his form since the campaign started. And it will not have helped that the American already has a move lined up for the summer. But Chelsea will not be happy to see him featuring so infrequently, especially after splashing £58m to snap him up. He has featured in just 13 Bundesliga games this season, scoring just once. At the least, they may get an opportunity to see him at Wembley — although he is unlikely to start. Pulisic should also take note — there’s no better way to endear yourself to Chelsea fans than downing Spurs. It is not time to panic — that has been the overall message from Dortmund over the last few weeks. That makes sense too — five points clear of Bayern at the top, they are in a strong position to win the Bundesliga. They got into this position by going their first 15 games unbeaten, with Favre being the first manager to achieve that feat at Dortmund. This is a different vintage to the one Spurs encountered last season. Along the way, they have thrilled and captured hearts and minds in a way that no BVB side since Klopp’s has managed. They have scored 54 goals, with particular highlights being the 7-0 win over Nurnberg and the 4-0 thrashing of Atletico Madrid. But in recent weeks they have stumbled. The leaders have not won since January 26, were knocked out of the cup by Werder Bremen and somehow threw away a 3-0 lead against Hoffenheim at the weekend to draw 3-3. If there is a time for Spurs to play this Dortmund side, it is probably now. Next articleSociété – Psycho: Pourquoi les pères sont importants ?